A documentary filmmaker with a long involvement with Janácek’s opera examines how the composers's love for Kamila Stösslova inspired his late masterpieces, and whether audiences should trust his version of the relationship. Through his music, Janácek created distorted reflections of Stösslová as the woman he wanted her to be, and not as the woman she truly was. 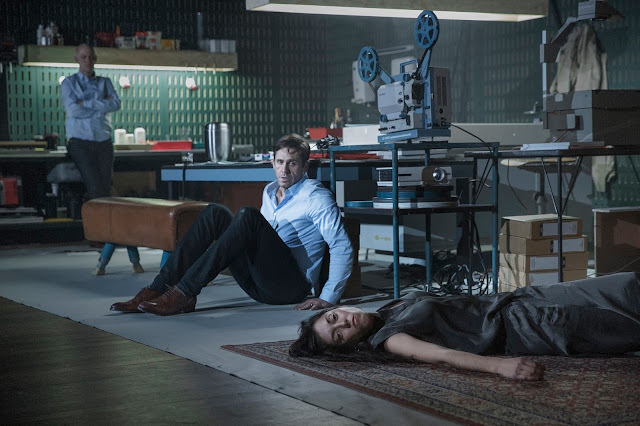 Ivo van Hove and designer Jan Versweyveld explain how they brought van Hove’s signature theatrical style to the "poetic and surprising" song cycle. The director shares his philosophy on directing (“Be open. Be transparent. Be yourself.”) and tells the story of the first time he met David Bowie. Ivo van Hove discusses how he brought Diary of One Who Disappeared to the stage and why he set the opera in a photographer’s studio. In this Paula Zahn interview with Ivo van Hove, the director discusses his origins, his methods, and his attraction to American playwrights. What did you think? Tell us what's on your mind in the comments below and on social media using #diaryofone. A clear case where more is less. The staging said nothing not already in the score and text and was occasionally distracting and the music failed to project in the big house. Voices were not impressive and the added numbers, while pleasant, didn't provide much counterpoint or insight into the Janacek. Not a fiasco but definitely underwhelming. A really good recital in a small hall would have been much more effective. I thought the voices were decent (except that the actor should not have been permitted to 'sing') but the staging was not only irrelevant and distracting but mostly incompetent and embarrassing. If it had been felt necessary to flesh out the 37 minutes of actual Janacek, perhaps some readings from his letters might have made the evening more illuminating. As the reviewer above stated, the performance was underwhelming and, frankly, over-priced! I agree with the other reviewers. The show was a disappointment. A few years ago I saw "Angels in America" at the BAM with Ivo van Hove's direction, and it was fantastic. The "Diary" - not so much. I liked the tenor Andrew Dickinson the piano Lada Valešová and the fragments of Janacek's letters but was disappointed in almost everything else. I did not like the set/stage design at all. It was like a small box on the large stage of the Opera House with cluttered objects. This set might have worked in a small, intimate space. The Opera House was too large for it. I did not like the lighting, why at the beginning was dark, so that the audience could not see the actors. Ivo van Hove explained in an interview that the stage was supposedly a dark room of a photographer based on Antonioni's movie, Blow-up. It might explain the darkness, but it does not help the viewer in the theater. The show was grossly overpriced, $140 for better seats. Running time was shorter than advertised. I have seen nearly every Ivo von Hove production in NYC, at BAM and elsewhere, and this was his worst. It is the first time I am genuinely disappointed. Von Hove couldn't care less about the music, and he treated the singers like set pieces, often pianissimo and invisible, behind a wall. His intent can only be understood by reading the lengthy program notes, and even then, I'm not sure it worked for me at all. I don't think Chutzpah is a Czech word but that is the word that comes to mind when I think about paying $140 a ticket for that failure. The only thing it had going for it was that it was mercifully short.The staging was confusing , the acting and singing were mediocre and it was a bore from start to finish. Such a disappointment! We had seen all his past shows at BAM but we now know that we need to spend more time selecting our shows to avoid leaving the theater so frustrated. Agreeing with all previous comments. The only thing I appreciated was the Janacek music, albeit all by piano with some decent voices. Nothing else made any sense nor reverberated. I was initially lead to believe this was an opera with a story. Far from it. Van Who? Please! The whole experience was opaque and frustrating to me. Having a concise brief summary of the content of each song in the cycle in The printed program would have helped prepare. And the letters should have been read at the beginning of the performance. What was with the piano lesson? I agree with everyone's comments, and I want to add that it's time to put the Kamila story as a framing device to "explain" the late flowering of Janacek's genius to bed. It has become a woefully overused middlebrow trope, like the kind in '50s technicolor movie biographies of composers, where all of the beautiful melodies are seen as a response to some tragic love story. Anyway, everyone who loves Janacek's music knows this story by heart already, and I would've hoped that a director with the reputation of van Hove would've addressed Janacek and his music with more subtlety and nuance. The song cycle is great though. This is by far the worst Ivo Van Hove´s piece I have seen. This was boring, irrelevant, and truly dissapointing. I have been deeply impressed with van Hove's work, and was looking forward to this all week. But it did leave me cold. If one didn't already know the relationship between songs and what was being presented on stage, it would have been nearly incomprehensible. That said, I was very pleased to see it, and thank BAM for providing the support. Not everything works, right? Even for the best. I loathed it. I had seen the cycle performed properly and beautifully by Matthew Polenzani at a vocal recital several months ago. This was pretentious and a terrible waste of $68 for my ticket at what lasted an hour. I have high hopes of any production by Ivo Van Hove, but this was a lazy, underwhelming, and unimaginative piece. And to have to paid $140 for this left me beyond irritated. Running time was advertised at 1.5 hours - I couldn't make up my mind if the shorter actual time was a blessing or another insult to my wallet. like many others here i have seen many productions directed by ivo van hove and have also seen many experimental productions at BAM. this one, however, left me irritated. did anyone vet this show for BAM? i paid $140 x 2 and, to add insult to injury, i even paid $15 to upgrade my seats. i suppose i'm glad i was close to see what little it could of the actors' faces, but i'm also glad it ended so quickly. i felt it was painful, irritating, and incomprehensible. also, the lighting director must have changed because it didn't resemble what earlier production photos showed. i'm all for seeing experimental and foreign theater, but at that price my expectations are much higher. it should have been less expensive and in a smaller space. in the future i am going to have to be more cautious on what i am buying at BAM. this production was BRILLIANT from start to finish and I would like to see a larger European influence on the American theatre. especially appreciated letting the older actor sing. his character is pivotal to the story and the passing of age and no longer possessing the voice of youth. the pianist was simply amazing with her tasteful pedaling and always voicing the instrument to bring out the most color and especially the melodic line. This is not a "happy" piece and it left me feeling deeply sad yesterday, questioning in my advanced age what love might be possible, what I've done with my life, how deeply we are affected by others. Janacek's music is profound and I especially appreciated the writing for the offstage voices. The long sequence that was totally a cappella was amazing. excellent pitch and the tenor entrance following with piano made a very difficult passage sound easy. I am interested by the many other responses to this production and their inability to sincerely appreciate it. This is the kind of stuff that I want BAM to be presenting - and especially at this high a level of quality.